Dogs that have been trained to sniff out new and old cell phones will soon be on the prowl at Rikers Island, The New York Post is reporting. 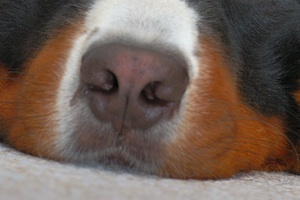 The dogs can sniff out the cell phones by following the scent of lithium batteries and the prison is hoping that the use of the $6000 dogs will cut down on the use of illicit cell phones by inmates, who often use the devices in order to orchestrate drug deals or to conduct other criminal affairs in the outside world. While prison officials can monitor calls made on the prison’s landlines, it is more or less impossible for them to keep track of cell phone calls that may or may not be made from within the prisoners’ own cells. The trained dogs do not just sniff out cell phones themselves either, with the Post claiming that the canny canines are also able to track down cell phone accessories such as earpieces and chargers as well. Illicit cell phones illegally used by prison inmates pose “a serious risk to staff and inmates”, according to a spokesperson for the Department of Corrections. The spokesperson did not elaborate on the nature of those risks and did not offer any other details of the program. Dogs that are capable of sniffing out cell phones are already being used in prisons in other US states.